“Get your mate and get karting!” That’s the message from Karting Australia Chief Executive Officer Kelvin O’Reilly. Karting Australia has launched a new initiative to allow even more people to experience the thrill and excitement of driving a kart through it’s ‘Bring a Mate’ program. Just as the name suggests, Bring a Mate has been designed to allow people who are interested to try karting to get behind the wheel on one of Karting Australia’s 88 licenced tracks across the country in a real racing kart. “The Bring a Mate program is an opportunity for women, men, boys and girls to experience kart racing,” said O’Reilly. A friend or acquaintance of the licensed Driver – their MATE, who is interested to experience the thrill and excitement of driving a competition kart on a real race track. Clubs that wish to do so, it can invite any of the local kart shops to participate on a Bring a Mate day provided that they are the holders of a current “Dealer Trade Licence”, by providing the equipment that is necessary for some of their potential Junior and Senior clients. The program is open to women and men, girls and boys so long as they are in the year of their twelfth (12th) birthday or older. ‘Bring a Mate’ is a demonstration experience, no competitive element is involved. At the end of the day it is all about the experience for your ‘Mate’. “Junior Sprockets, our Cadet and Junior introductory program has been an enormous success since being fully rolled out last year and with the support of SP Tools, our Official Development Program Partner, we expect Bring a Mate to be equally or more successful,” added O’Reilly. 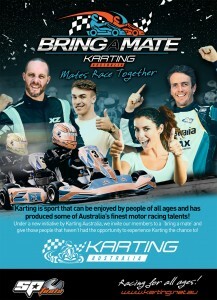 The first Bring a Mate event will be conducted at the Ipswich Kart Club in Queensland on Saturday March 18. MATES must be in the year of the twelfth (12th) birthday or over.